Hands up if you love cookies. As you can see from the picture above, my son certainly does. And, believe it or not, that is actually a good thing. My son is a very selective eater. Sometimes he is so restricted in the foods he is willing to eat that I worry he is not getting enough of the essential nutrients. Which is why I love creating nutrient-dense cookies that can help fill in some of the gaps. 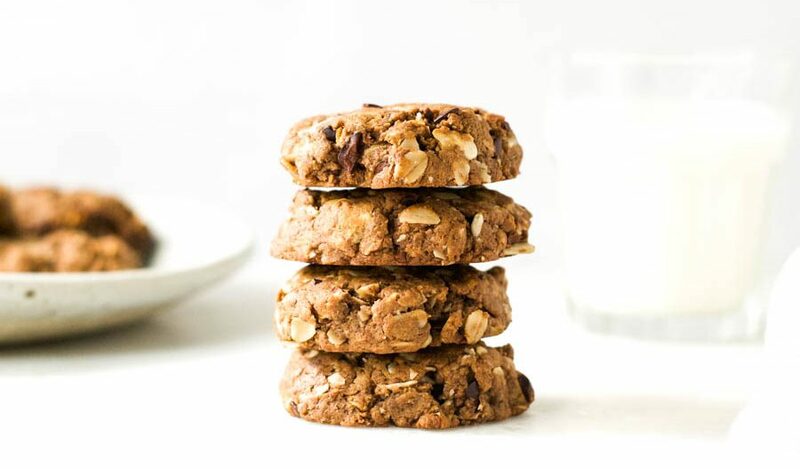 These peanut butter cacao nib cookies are a great way to get some fiber and protein into his body while he snacks on a sweet treat. Keeping our children well fed is one of the basic needs we are expected to meet as parents. When we are unable to do that, it can make us feel like terrible failures. I confess, there has been many a dinner time when I have hidden in the other room and had a little cry. It is frustrating and upsetting when your child repeatedly refuses the food you make. While there are many tactics you can use to help your child eat well, sometimes they don’t work no matter how much patience and perseverance you display. That is where I currently find myself. Which is why we will be meeting with an occupational therapist soon. I am sharing this to let parents of selective eaters know – if it gets too much, you can seek professional help. 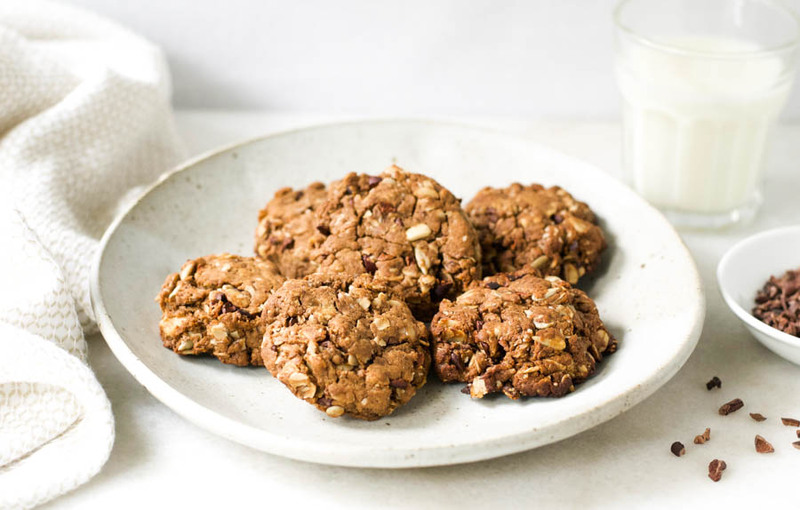 And in the meantime, I’ll be making more batches of these peanut butter cacao nib cookies. Line baking sheet with parchment paper or lightly coat with cooking spray. 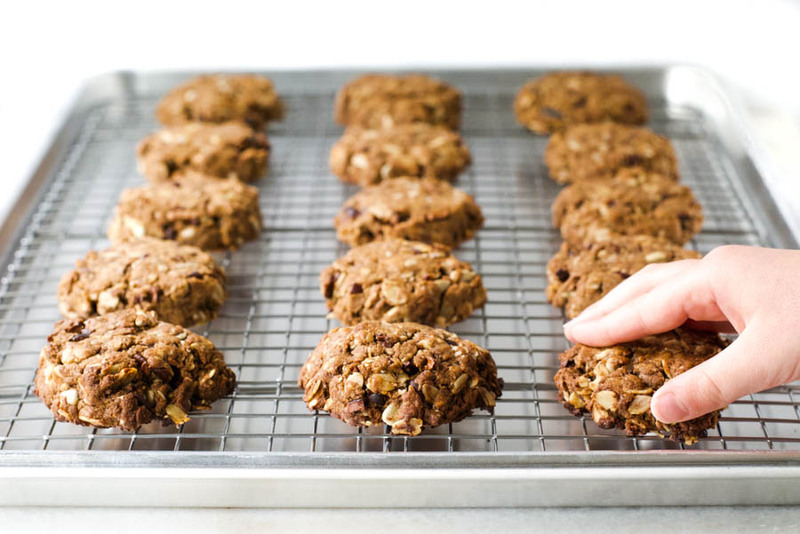 In a medium bowl, mix the oats, seeds, cocoa powder, and baking soda. In a separate bowl, pour ¼ cup hot water over the dates, let sit for a few minutes. Remove dates from the water and take out the pits. In a blender, blend together the dates and egg. If it is too sticky, add a tsp water. Put the date and egg puree in a large bowl. Mix in the peanut butter, vanilla extract, and dry ingredients, and stir until well combined. Put tablespoon-sized heaps of mixture on the baking tray about 2 inches apart, and lightly press down into cookie shape.